Band performance times for the 7th annual Monster Energy Carolina Rebellion have been announced, along with week of show ticket prices. 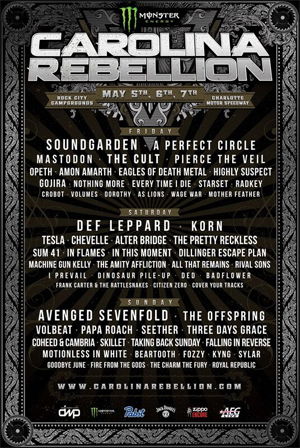 The Mid-Atlantic’s biggest rock festival – held May 5, 6 & 7 at Rock City Campgrounds at Charlotte Motor Speedway in Charlotte, NC – features over 60 bands on four stages, led by SOUNDGARDEN, DEF LEPPARD, and AVENGED SEVENFOLD. In addition to music, Monster Energy Carolina Rebellion will feature some of the best food that the Carolinas have to offer – including four styles of BBQ and a smorgasbord of savory eats and sweets ranging from custom pie cups and doughnuts to bacon flights and wood fired pizza – at the Pig Out Village. Fans will have access to artist signings, meet and greets, exclusive acoustic performances, and more at onsite experiences including the Monster Energy Experience, the Jack Daniel's Experience, The Music Experience, FYE Fan Experience, Zippo Encore and more.